Homer, Troy, "The Iliad" & "The Odyssey"
Our second story is the legend of the founding of Rome by the twin brothers, Romulus and Remus. Their grandfather was the rightful king of Alba but he had been deposed by his brother. Their mother was supposed to be a virgin priestess of the goddess Vesta, but she got pregnant, some say by Mars, the god of war. Their great-uncle recognised that Romulus and Remus were more than human and attempted to have them killed. The servant entrusted with this task abandoned them by the river Tiber, which was in flood. They were found by a she-wolf who suckled them, and a woodpecker, who fed them. A swineherd later found the babies and brought them up. Romulus and Remus grew up into strong young men, born leaders of the shepherds and outlaws in the surrounding countryside. Remus was captured in a brawl with some of his grandfather's shepherds. Romulus attempted to rescue his brother, and the presence of twins of about the right age uncovered the secret. With their own followers and their grandfather's men, they deposed their great-uncle and restored their grandfather to his throne. 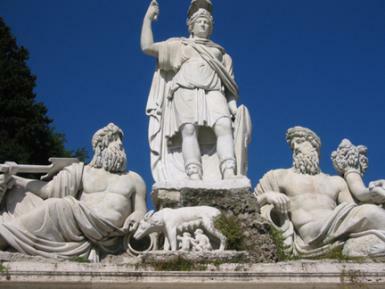 Romulus and Remus did not want to serve anybody else as king, so they left Alba to found their own city. They chose different sites, and decided to seek omens for which would be better. Remus looked round and saw six vultures, a good omen, whereupon Romulus claimed to have seen twelve, even better. While they were arguing, Remus jumped contemptuously over the walls Romulus had built. Romulus was made even angrier by this, and in a fit of rage, killed his brother. Romulus buried Remus, and carried on with building his city. There was one problem: all the inhabitants, being shepherds, runaway slaves, and brigands, were men. Romulus held games in honour of the god Consus, and invited people from the Sabine communities roundabout. While they were watching the games, Romulus gave a signal and the Romans seized the young Sabine women who were attending the games and made off with them. The Sabines later tried to get the women back, but by this time they had married their abductors and some of them had become mothers. The women interposed themselves between the two armies, and pleaded not to be forced to choose between their relatives by blood and their relatives by marriage. Peace was restored and Romulus and Tatius, the king of the Sabines, were made joint monarchs. Tatius was killed after only five years, and Romulus then reigned alone. After having reigned over Rome for 38 years, Romulus disappeared in a violent storm, and it was announced that he had been taken up to heaven, from where he would continue to look after Rome's destiny as the god Quirinus. The founding of the city was carefully tied into history. The Roman historian Livy (late 1st century B.C.) wrote his history giving dates AUC (ab urbe condita = from the founding of the city). His history starts with the founding of Rome. Plutarch, a Greek biographer of the early 2nd century A.D., wrote a biography of Romulus in which he dates the founding of Rome by referring to eclipses observed in Greece. He also mentions attempts to historicise the information by interpreting the she-wolf as a prostitute and Mars as someone dressed up to fool their mother (Plutarch Romulus). For the Romans, the supernatural details did not detract from the historicity of the events. Equally supernatural stories and prodigies of nature abounded in accounts of other figures in Roman history, down to the emperors. Which is the Best Myth in Greek Mythology? What's the Difference Between the Greeks and the Romans?